Vous connaisez Luc Besson? Those of us d'un age certain with our lapsed Empire subscriptions retain fond memories of his earlier films, from Leon, with assassin Jean Reno giving sniping lessons to a young Natalie Portman, to Nikita, with Anne Parillaud as, er, another assassin. And then there's his 1985 masterwork of style over substance with pre-Highlander Christopher Lambert and post-One Deadly Summer's Isabelle Adjani. How could you, Daniel Day-Lewis? Oh, Isabelle. Now, in our many years of light lunches, we endeavour to favour the independent establishment. Yet sometimes, in the name of convenience, we falter, hence the odd trip to KFC or McDonald's. Forgive us, Grenvyle, for we have partaken of salty and saturated foodstuffs. Today's another first, though. Ipswich's underground railway is legendary, but who knew that Woodbridge had its very own Subway? Andy, that's who, gracing us with a rare lunchtime appearance despite Project X. Kev's here, too, slightly narked that we've already ticked off the much more attractive sounding Christine's up the road. 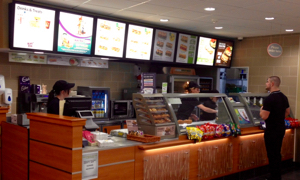 Not having its own premises, Subway's host organism is the venerable Co-op opposite the jazzy buskers. Past the pre-packed snacks, past the cous-cous and accelerating past the veg brings us to the information overloaded counter. Us being noobs, we're not entirely sure how this works. Smiling girl helps out the old-timers: choose your length, choose your bread, choose your filling, choose your salads. Complex. Six-inch, cheese and herb, tuna, little bit of everything for me. Love the Hubble precision of that metal ruler for cutting that 15cm size. There's even flatbread, an especially Woodbridge touch. Our "sandwich artists" work in a blur and, in no time at all, we're handed our greaseproofed packages. That £3 for a selected six-incher plus drink (classy Tropicana) is a steal. Guidelines, we're always reminding Kev, require there to be hot drinks plus seating. Here, to the left, is a communal high table for us saps, soon to be joined by a bunch of sixth-form kids, plus O2 WiFi, a boon in The 'Bridge. Snob that I am, I believe this is my first Metronomy purchase. Is it OK? It's really, really good. Filling in all respects and top value too. Five minutes for a sampled regular latte, not half bad, and some three-for-a-quid cookies. I will take the Subway again. If it was a car -- Vauxhall Mokka. If they were passing by -- Richard Bohringer.